"Summer breeze, makes me feel fine, blowing through the jasmine in my mind." Venus, the planet associated with Aphrodite and love, has inspired the latest addition to Perfume Illuminated. The list of Venusian plants is quite vast and includes many that Beth and I have already highlighted in this Materia medica of sorts. As Beth and I discussed all the possibilities we finally settled on Jasmine since the species known as Jasminum sambac is currently blooming here in the woodland. 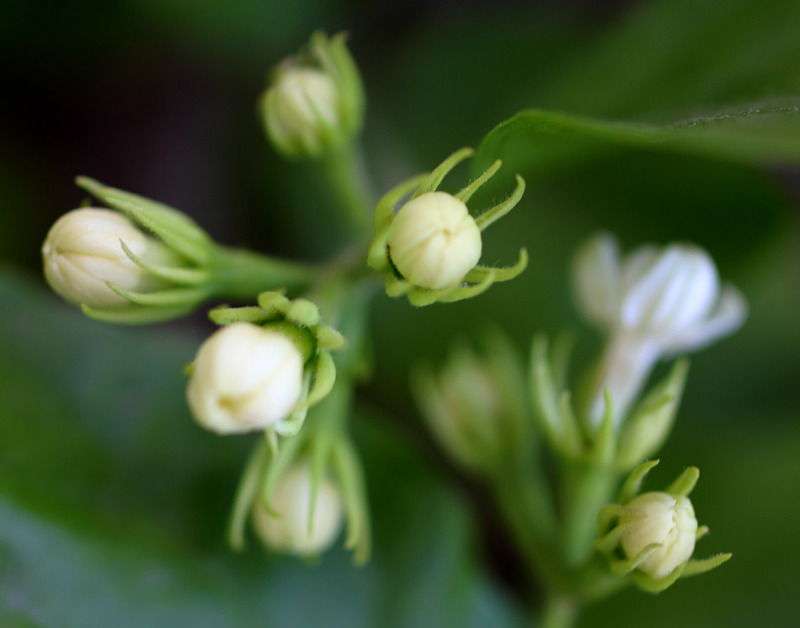 Although the common name the sambac species is Arabian jasmine this gem, with small white waxy flowers, is native to the tropical regions of Southeast Asia, not the arid climes of the Middle East. Despite this fact, the plant does quite well for me here during the warmer months in Southern California. Since I am in the hillside where clay soil and gophers abound, I put the Jasmine sambacs in pots, so far I have seven of them and desire more. The uses of the small flowers extend to flavoring green, pouchong and jasmine tea, in Hawaii it is called Pikake and used in fragrant flower leis while in India the flowers are used for devotional garlands of hope. 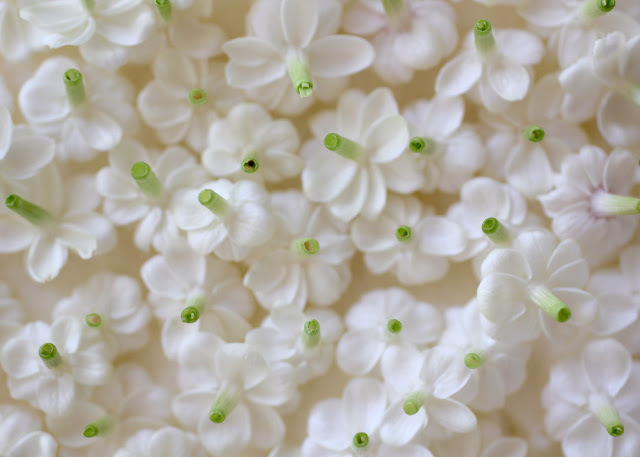 In the palette of the natural, botanical perfumer we have four types of Jasmine to work with: Jasmin grandiflorum, Jasmin flexile, Jasmin auriculatum and Jasmin sambac. Those who do not use whole essences exclusively have a large array of isolates and augmented Jasmine notes available to them. These four aromatics all have an opulent, intoxicating, heady, exotic, complex, sweet and floral fragrance with varying subtleties. In perfume they are considered mid to base notes with strong aromatic strength. 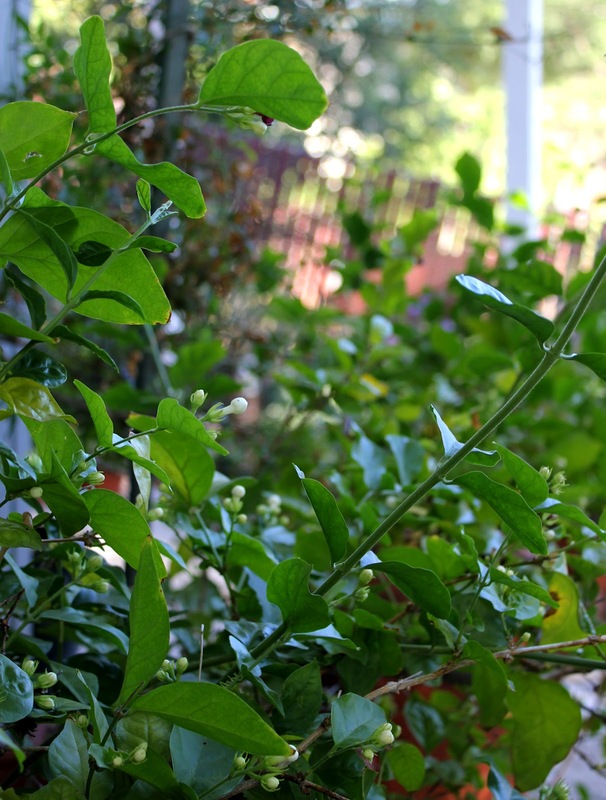 Jasmin auriculatum: A heavy, Gardena-like scent with fruit and strong dark, animalic and indole notes. This essence is available as an absolute from India. 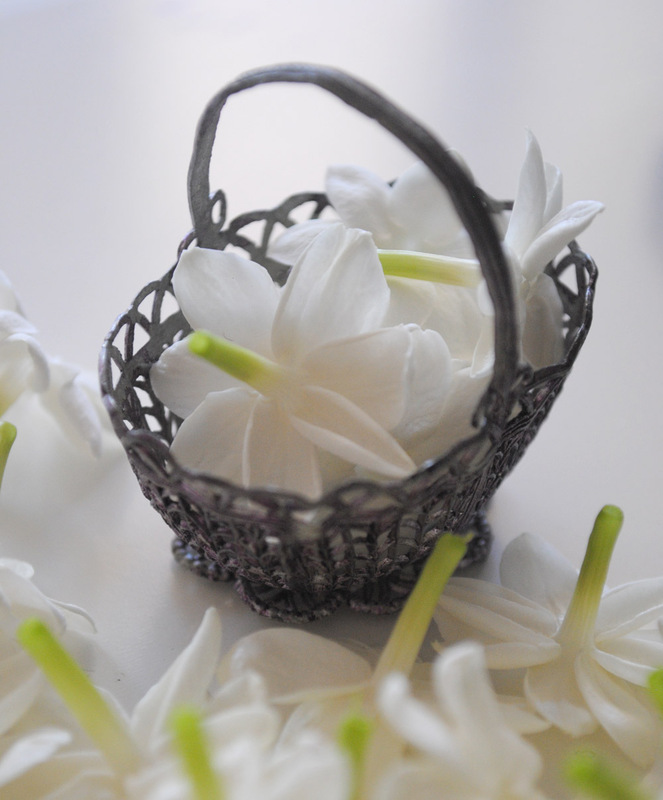 Jasmin flexile: Is a very clean and delicate, exotic floral similar to other flowers in India such as Night Queen, Champaka and Frangipani. 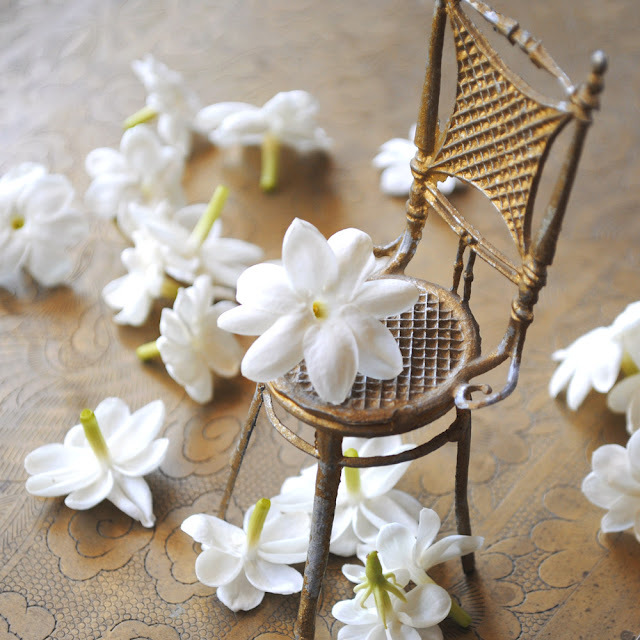 Jasmin sambac: Strong fresh, green, fruity and herbaceous notes compared to the others with an air of mystery. The essence contains some animalic and indole notes not present in the fresh flowers. It is available to us as an absolute from India and a c02 extract from China. 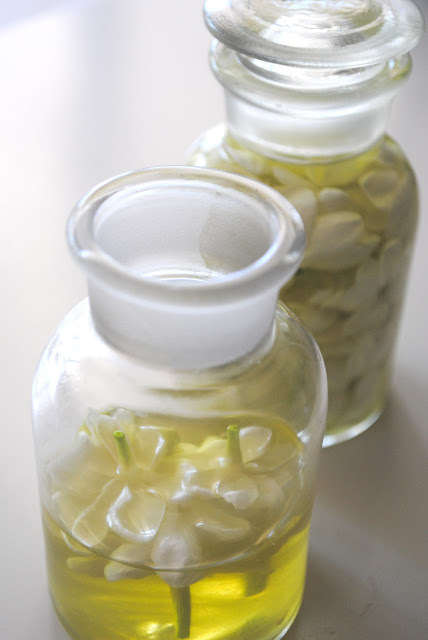 In aromatherapy Jasmine is an aphrodisiac used in wedding and sensual blends. The essence is also used extensively for the reproductive system. The attributes are: calming, restorative and uplifting with It's elemental is water and relates to the planet Venus and the Moon. According to Celtic herbal lore jasmine is one of the herbs of Méan Earraigh (Spring Equinox) attracts wealth, used for prophetic dreams and in love spells. Since my plants started blooming a week ago I have started making a pomade or a cold enfleurage with them which I intend to use in body butters. Each morning, as a daily meditation, I gather the small flowers from the plants and place them into a dish of mango butter to infuse the aroma. The next morning I remove the spent flowers from the previous day and add new ones. I repeat this process until I feel the butter has absorbed enough of the aroma. This process is the same one used to infuse green tea with the aroma and flavor to produce jasmine tea. When the flowers are spent they turn pink, I gently remove them and place them into a ritual dish with the intention of attracting wealth and spiritual love. 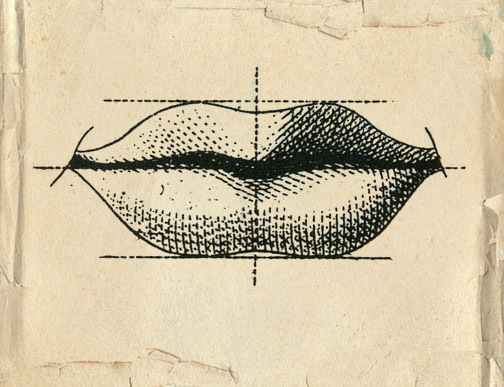 For more details on how to make an enfleurage please refer to the post at this link from March 2012. 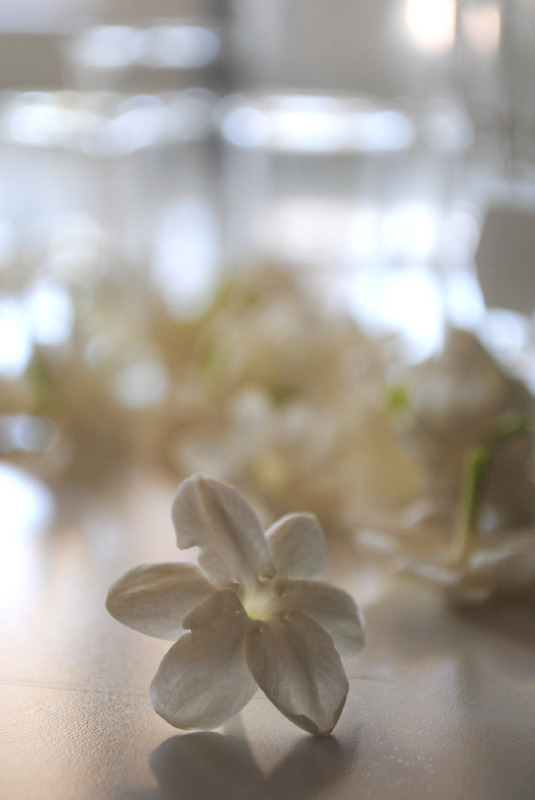 I wrote on how to make a Jasmine tincture over at the Lillyella blog at this link. 1 Williams, David G. Perfumes of Yesterday, published by Michelle Press Williams, 2004. 2 Shutes, Jade. Blending Manual, published by Jade Shutes/The Institute of Dynamic Aromatherapy, 1996. 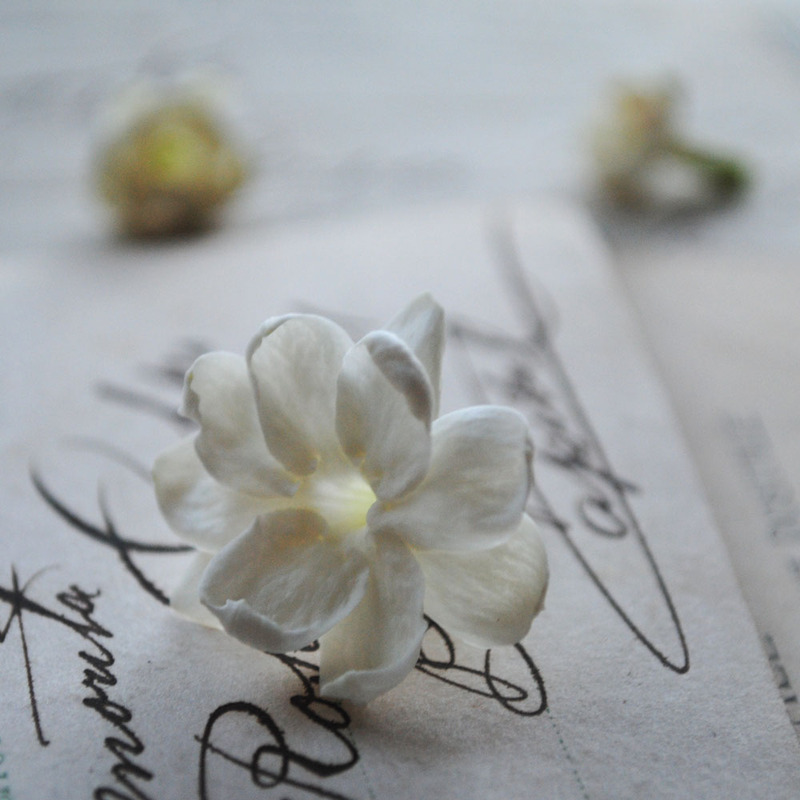 IMAGES: Jasmine sambac blossoms from my garden and in the cold enfleurage process. 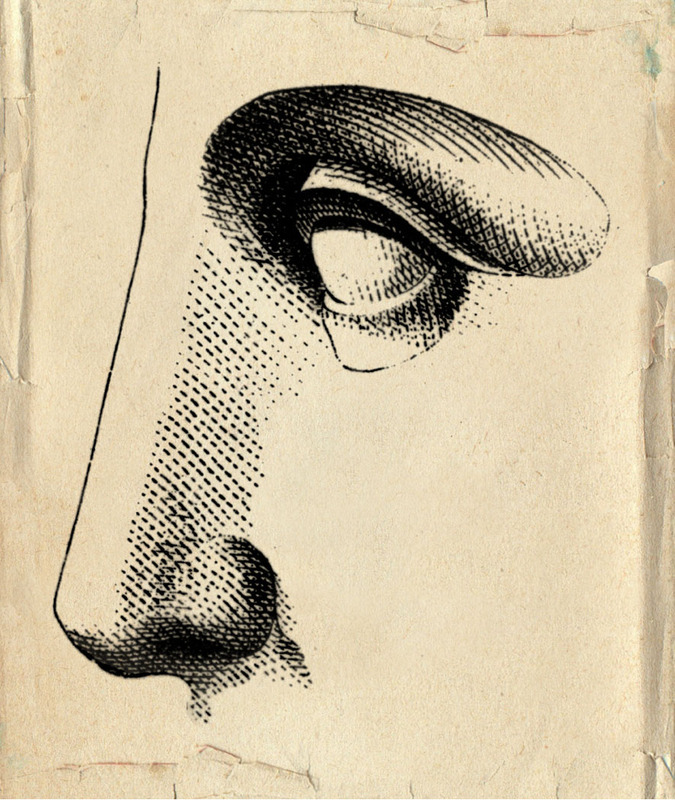 The image of the Nose and Mouth are old engravings that I have cleaned up and modified.